Plot: Eleven-year-old detective Timmy Failure and his business partner, Total the polar bear (Total Failure, Inc.) tackle cases and schoolwork with a winning and winsome combination of luck and unearned self-confidence. Child Enjoyment: 8/10 Timmy’s one funny dude. Also, as a legacy several times over, the child is particularly and endlessly amused by Timmy’s friend’s “Stanfurd” aspirations. Parent Enjoyment: 10/10 I’m the person who bought it, no pressure from the child, just had to have it. I read it when the kid is not around. I’m a fan. Age Appropriate: At six-turned-seven, Z is a little young to fully understand how an unreliable narrator works. And boy, is Timmy unreliable, in all the best ways. The child still find him hysterically funny. Clearly, Timmy’s appeal knows no bounds. Pain Factor: Really low. 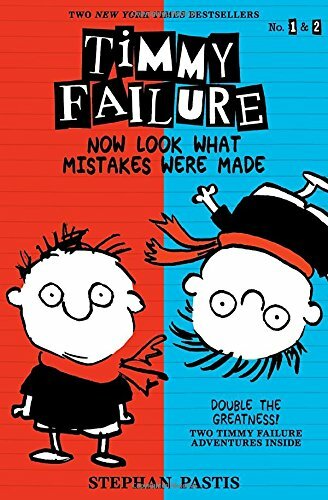 The book is witty, fast moving, embellished with charming pictures by writer/artist Stephan Pastis (of Pearls Before Swine fame) and laugh-out-loud funny. Story Assessment: Timmy Failure is the founder, president and CEO of detective agency Failure, Inc. Once he brought on his business partner, Total the polar bear, the agency’s name changed to the snappier Total Failure, Inc., and there’s been no looking back. No matter is too small for the intrepid duo. Over the course of the first book they take on such stumpers as the case of the missing halloween candy, and the mystery of the T.P.-ed house. The book consists of fifty-nine short, illustrated chapters, through which Timmy juggles his caseload with schoolwork, friendship maintenance, and the management of his long-suffering single mother. His world is populated by delightful, well rounded characters, including best friend Rollo Tookus (of Stanfurd fame), female admirer Molly Moskins, and rival/sworn enemy Corrina Corrina, aka the One Whose Name Shall Not Be Uttered, aka the Weevil Bun (Evil One). Timmy may not be a great detective, but he’s sure great fun. Author/illustrator Stephan Pastis’s voice is distinctive and his narrative style engaging. Of course, I may be somewhat biased, as I understand from Mr. Pastis’s bio that he went to UCLA Law School (gooooo Bruins! ), and ultimately gave up a legal career to become a comic book writer and artist. In other words, living the dream. But seriously. Timmy Failure’s the man. Just ask him. In Summation: The adventures of Timmy Failure are full of humor and heart. We love him at our house. I’ll bet you’d love him in yours. There are currently seven books in the Timmy Failure series, and a Disney feature in the works. My particular book is a twofer (Mistakes Were Made, and Now Look What You’ve Done.) You can buy the chronicles of Timmy Failure’s adventures at Amazon, or anywhere else that books are sold. He’s that big a deal.